When it comes to your average daily breakfast, which statement best describes you? 1: I have plenty of time to make a good breakfast for me and my family. 2: I eat something quick and easy, maybe packaged, but I crave something more wholesome and substantial. 3: I struggle just to get out the door – breakfast is an afterthought. Customize: Feel free to use a different mix of meat, veggies, and cheese. Try ham, bacon, Canadian bacon, turkey sausage or pepperoni for meat. Try mushrooms, potatoes, sweet potato, kale or hot peppers for veggies. Scrambled or whole eggs: You can mix eggs with cream, salt, and pepper to make scrambled egg cups – or you can simply crack a egg and pour it into the muffin tin whole. Either way is fine. Make-ahead: Make a batch of 6 egg cups on Sunday night, and enjoy them for the next 2 to 3 days for breakfast. Make-ahead breakfasts are perfect for the non-morning person. The ones who hit snooze one too many times. (You know who you are). You can eat these egg cups plain. But if you’re craving something more substantial, you can use the egg cups to make these 80-cent breakfast sandwiches. Of if you’re a low-carb eater, make a batch of cauliflower English muffins. In either case, this is a super cheap breakfast idea. The recipe is for the scrambled egg cups - the more yellow egg in the top photo, above. If you want a whole baked egg, simply crack the egg and pour it into the (greased) muffin tin slot. Preheat oven to 375F. Grease a 6-slot muffin tin generously with cooking spray. In a mixing bowl, beat eggs, cream, salt, pepper, and garlic powder. Pour egg batter evenly into muffin tin. 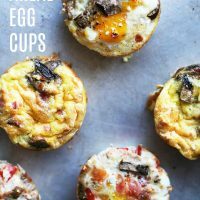 Place an even amount of meat, vegetables, and cheese evenly into each egg cup. Bake for 12 to 15 minutes, until eggs are set.